Personal note... in 5th grade me and two friends wanted to lip sync Naughty By Nature's OPP for the school talent show. We auditioned with my cassette single of the song but the powers that be didn't approve of the lyrical content. They knew what OPP stood for where we were just dumb kids. So, we went with Hammer's 2 Legit 2 Quit. It's was a cringy as it sounds but none of us knew magic tricks so there ya go. Did you know that MC Hammer, Oakland California’s favorite son, was a batboy for the A’s from 1973-80? 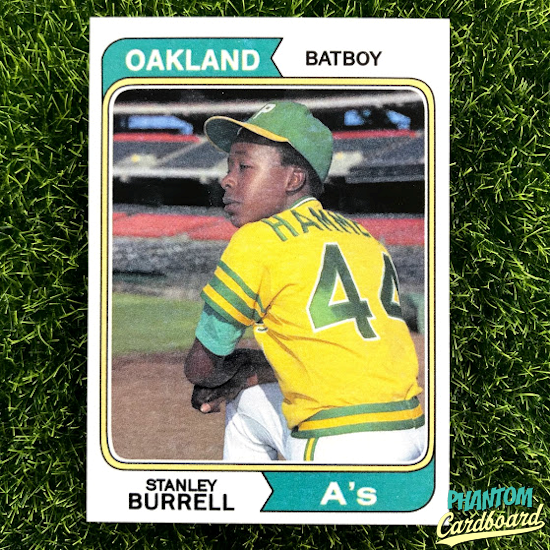 An 11 year old Hammer, real name Stanley Burrell, would hustle outside the stadium and his entrepreneurial spirit caught the attention of Athletic’s owner Charlie Finley who gave him a job as a batboy with the team. Hammer eventually worked his way up to basically being the eyes and ears for Finley while he was in Chicago running his insurance business. Hammer was eventually given the title of executive vice president as a teenager. Finley even had a hat made for him that had “VP” in place of the A’s logo. It was as a batboy that A’s players nicknamed Burrell “Hammer” due to his resemblance to Hammerin’ Hank Aaron. This card finally gave me a chance to use the 1974 Topps design. I’ve been wanting to add it to my custom card portfolio for quite some time but haven’t had a subject that made enough sense with it until this card. I appreciate the vintage looking rounded corners and the uncluttered straight forward design. It just looks very classic to me.